He is known for reading out the so-called "independence declaration" of Donetsk militants. 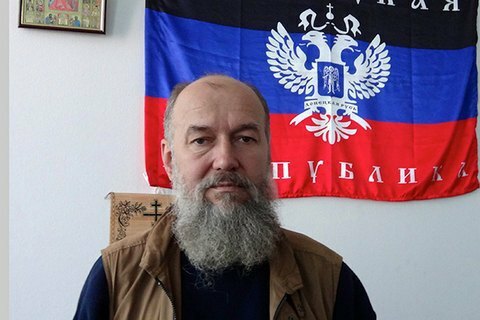 Volodymyr Makovych, one of the founders of the self-proclaimed Donetsk people's republic (DPR), died in Donetsk today, according to separatist news websites. A former head of the so-called DPR foreign ministry, Borys Borysov, also reported Makovych's death. Makovych read out the "independence declaration" of the DPR in the Donetsk regional council on 7 April 2014. He also read out an address to Ukraine's wealthiest businessman Rinat Akhmetov in May 2014, in which he described four scenarios of Donbas development and described the DPR as impostors who took the region hostage. He was in charge of the DPR "supreme council" for some time. In July 2014, he got arrested by other militants at the heat of infighting in the DPR. As reported earlier, Mykhaylo Tolstykh, better known as Givi, commander of the Somali paramilitary group, was killed in an explosion in Makiyivka on 8 February. The head of the people's militia of the self-proclaimed Luhansk people's republic, Oleh Anashchenko aka Spets, was killed when his car exploded in Luhansk on 4 February.